Hollywood aims for record year at the box office. Here's why. 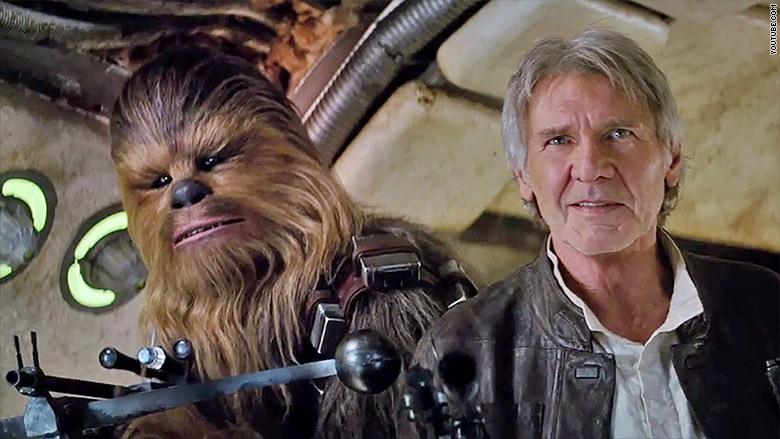 Han and Chewie aren't the only reasons why Hollywood will have a happy holiday season. The box office has had a great 2015 and is on pace to be an historic year for Hollywood. Currently, the U.S. box office stands at $9.1 billion for the year. That is just 0.2% more than the record pace set by 2013's final total of $10.9 billion, according to Rentrak (RENT). Setting a record will be difficult, especially since 2013 finished the year with megahits like "The Hunger Games: Catching Fire" and "Frozen." However, thanks to a mix of possible sleepers and blockbusters scheduled for the rest of the year, this year's box office may have the magic number of $11 billion in its sights if it -- ahem -- stays on target. 1. "Star Wars" and "Hunger Games" could be -- surprise, surprise -- historic: Much has been written about how "Star Wars: The Force Awakens" and "The Hunger Games: Mockingjay - Part 2" are setting up to have a historic holiday, but just how big is the real question. "Mockingjay - Part 2" -- which opens on November 20 -- is competing with itself for biggest November opening ever, trying to break the record $158 million "Catching Fire" made in 2013. As for "Force Awakens," the seventh "Star Wars" film and first with Disney, is taking on history itself. With fans watching the film's trailers in droves and crashing ticket sites over demand for opening night tickets, many in the industry are projecting that the "Force Awakens" could be the biggest opening of all time and one of the biggest blockbusters in history. 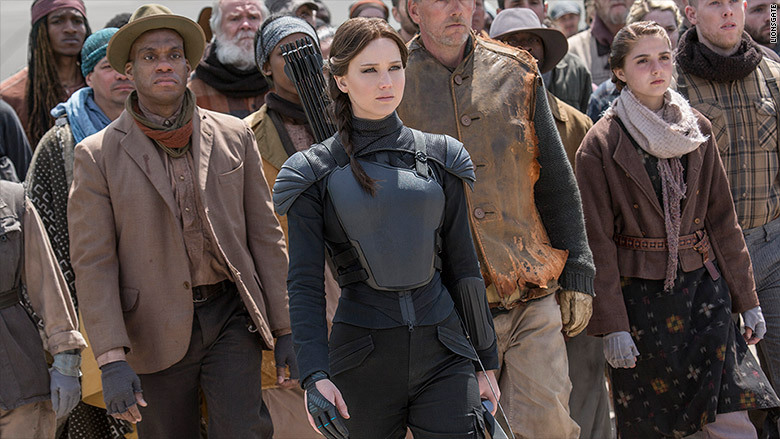 The odds should be Katniss' favor when it comes to the box office this November. 2. "Creed," "Sisters," and "The Hateful Eight" are dark horses: Lost in all the "Star Wars" and "Hunger Games" chatter are a few films that could end up being dark horses at the box office. The best example of this could be "Creed" on November 25. The film starring Michael B. Jordan and Sylvester Stallone is the next chapter in the "Rocky" series, which when accounting for inflation has brought in $1.5 billion since 1976. Another film that could be a sleeper is Universal's "Sisters." The film has a huge challenge opening on the same weekend as "Force Awakens," but the Tina Fey and Amy Poehler comedy could grab an audience uninterested in lightsabers. Quentin Tarantino also returns to theaters on Christmas with his eighth film, "The Hateful Eight." The director has courted controversy with his comments regarding police brutality, but Tarantino's snowy western could mimic his last Christmas release, "Django Unchained," which had a $30.1 million opening in 2012. 3. Pixar is back again, this time with dinosaurs: Most years moviegoers get one Pixar film, but thanks to "The Good Dinosaur" the 2015 box office will get two. The animated film, which explores what if dinosaurs never went extinct, hopes to jump on dinosaur fever started by "Jurassic World" and reach the joyous box office heights of Pixar's other film this year, "Inside Out." However, "Good Dinosaur" did have production issues which delayed it from 2014 to its release on November 25, so it's a bit of a wildcard. 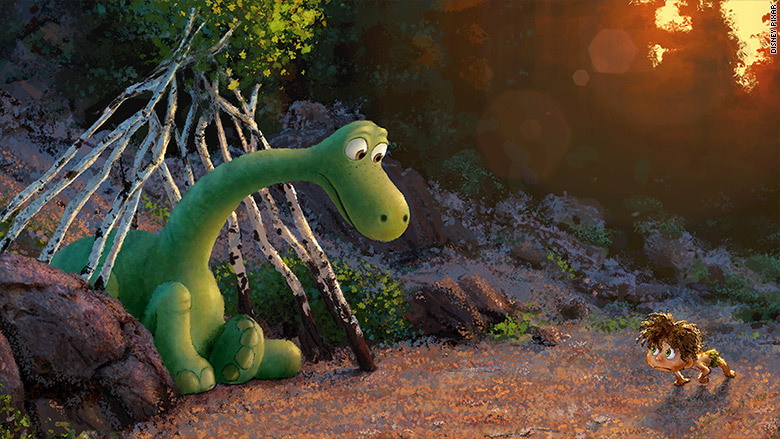 Will "The Good Dinosaur" be Pixar's second big hit of the year? 2015 has been a interesting year at the box office, but even though there's still plenty of big films to come it may need more than The Force to break the $11 billion record. "With another $2 billion required between now and the end of the year to put us over the top, every single wide release film between now and New Year's has to essentially knock it out of the proverbial box office park," said Paul Dergarabedian, senior media analyst at Rentrak. "You need a solid foundation of low and mid-tier films to support an overall record breaker of a year... If not, it has still been a watershed year for Hollywood."